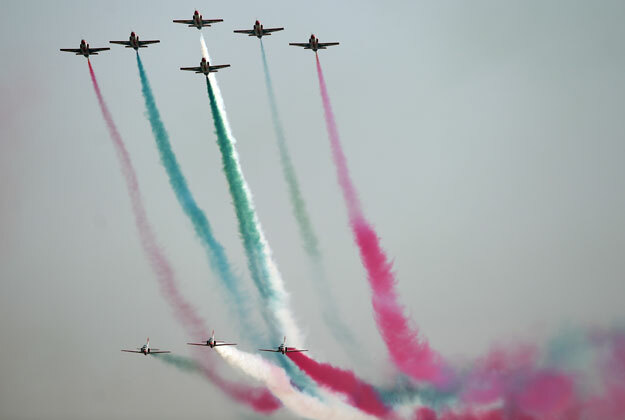 ISLAMABAD: With fighter jets zooming across the sky, Pakistan on Thursday showcased its military might in a grand parade marking the 77th Pakistan Day that has for the first time involved the contingents of foreign armies. Pakistan Day commemorates the passing of the historic Lahore Resolution on March 23, 1940, when Muslims of the Subcontinent demanded the establishment of a separate homeland to safeguard their rights in the then British colony of India. The government authorities made stringent security arrangements to deter any untoward incident. Cellular phone networks in the capital were suspended and roads leading to the Parade Ground near Shakarparian were heavily guarded. 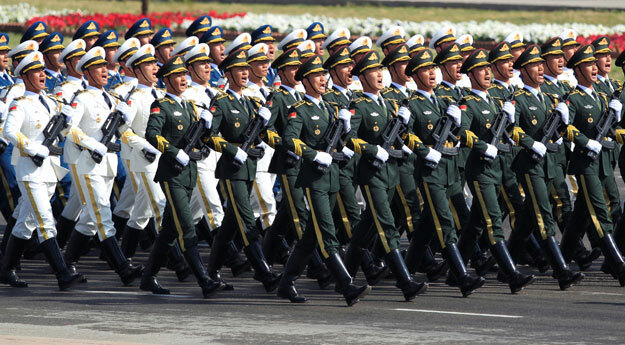 The special feature of this year’s parade was the participation of troops from China’s People’s Liberation Army and Saudi Army, besides Turkish Jannisary Military Band (Mehteran) that showed deepening of ties between Pakistan and the “brotherly” countries. The march-past, weapons display, cultural and aerial shows captured the imagination of the public. Apart from President Mamnoon Hussain, Prime Minister Nawaz Sharif, federal cabinet ministers, parliamentarians, foreign dignitaries, diplomats, chairman joint chiefs of staff committee and services chiefs, Chief of the National Defence Forces of South Africa General Solly Zacharia Shoke also witnessed the impressive pageantry. 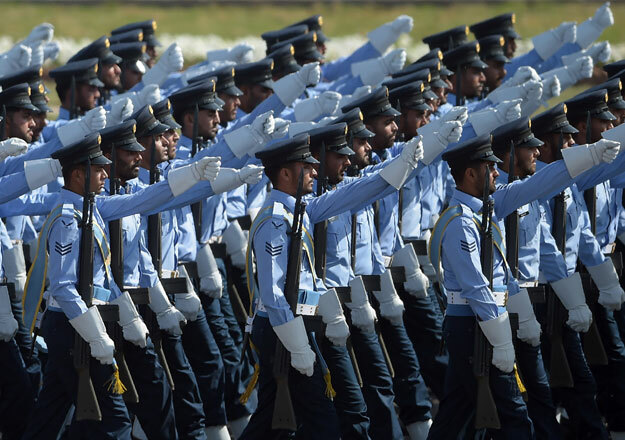 The ceremony was started with Chief of Air Staff Air Marshal Suhail Aman leading the fly-past and presenting salute to the chief guest of the ceremony, President Mamnoon Hussain, and other participants. It was followed by famous national song ‘Jeevay Jeevay Pakistan’ played by the Turkish band (Mehteran) that took the whole crowd by surprise. 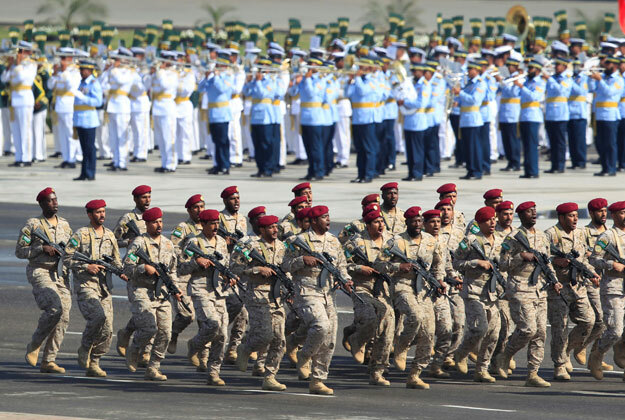 The contingents of the Chinese and Saudi Arabian armed forces also marched past, while Special Services Group of the three forces presented the farewell salute to those in the gathering. Another enthralling event of the day was aerobatic manoeuvres by the Brave Hearts (Sherdil) team comprising six jets of Pakistan Air Force (PAF). Indigenously built multi-role aircraft J-F 17 Thunder was also part of the fly-past. As part of the mechanised drill, the recently-inducted sophisticated air defence system by the Army Air Defence was part of the exhibition. 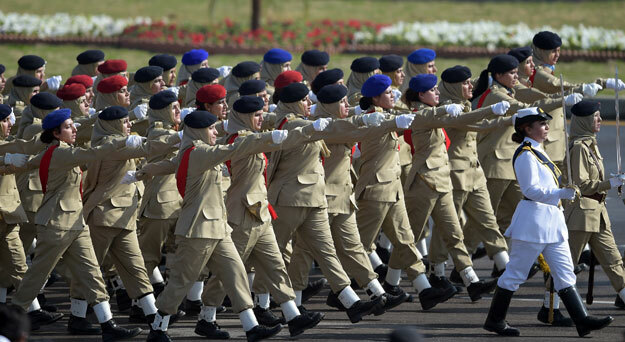 The highlight of the day was the joint military parade held at the Parade Ground near Shakarparian hills in Islamabad. 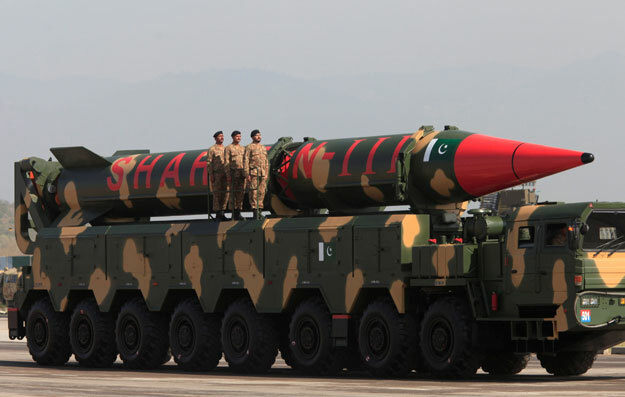 Besides cruise missile, the latest versions of Shaheen-I and Shaheen-III missiles also made their maiden appearance in the parade. The PAF’s flypast included F-16, JF-17 thunder, F-7 PG, Mirages, F-7P, SAAB-2006 and Kurakuram Eagle AWACS aircraft and P-3C Orion aircraft of the Pakistan Navy. Burraq drone was also part of the parade. Mechanised columns were led by the armoured corps. It consisted of Al-Khalid, T-80UD and Al-Zarrar tanks. The contingent of mechanised infantry consisting of armoured personnel carriers, TOW (tube-launched-optically tracked-wire guided missile system), was also part of the spectacle. The artillery contingent included M-11-A2 guns and 155mm howitzers, which can fire up to 30 kilometre. It also included 130mm medium guns having a range of 27km. Army Air Defence contingent consisted of Sky Guard Radar and 35mm Oerlikon Guns, one of the best air defence guns in the world. 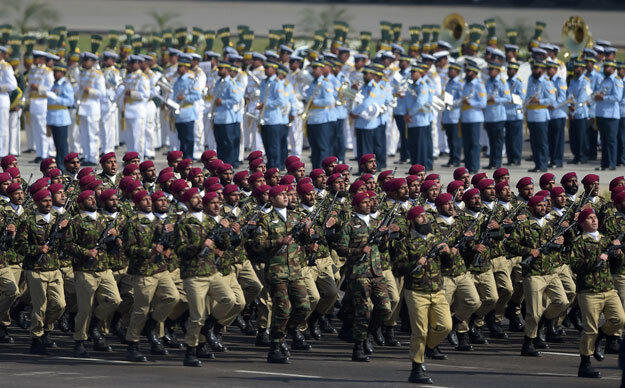 Pakistan in 2015, held its first Pakistan Day parade after a hiatus of seven years. PAF Air Defence contingent consisted of Mobile Pulse Doppler Radar, SPADA-2000, and the Air Defence Command and Control System. The Army Engineers and Signals contingents with state-of-the-art equipment also made their appearance on the scene. 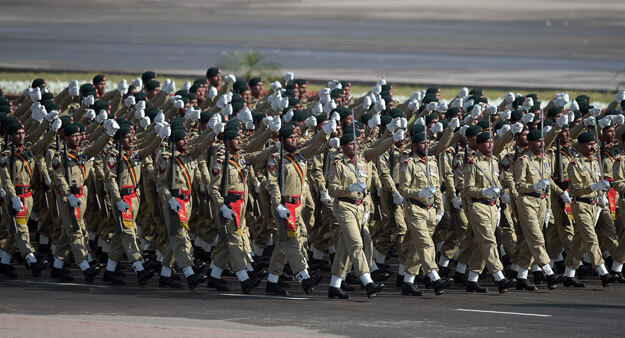 Marching columns included troops from Baloch, Azad Kashmir, Sindh, Northern Light Infantry, Mujahid Force, Frontier Corps Khyber-Pakhtunkhwa, contingents of Navy and PAF, Islamabad Police, Lady officers, Armed Forces Nursing Service, Girls Guide, Boy Scouts. 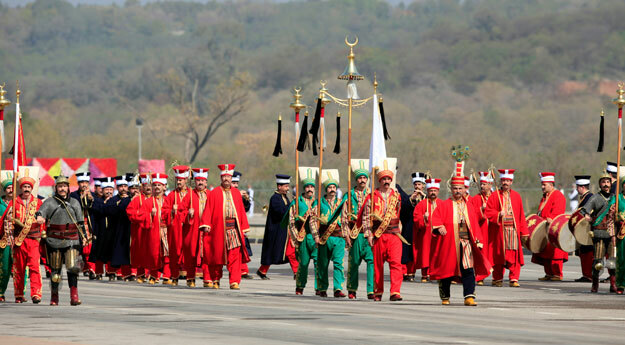 Floats of Azad Jammu and Kashmir, Balochistan, Gilgit-Baltistan, Khyber-Pakhtunkhwa, Punjab and Sindh depicted culture of their areas. About 19 helicopters of Army Aviation participated in the parade. ZULU-10 attack helicopters, Cobra attack helicopters, Fennec, Bell-412, Puma and MI-17 participated in the flypast. Commandos of three services also made free-fall jump from a height of 10,000 feet and landed at the parade venue. The General Officer Commanding SSG led the skydiving. He presented Pakistan Flag to the President after safely landing at the venue. President Mamnoon Hussain, in his speech, expressed Pakistan’s willingness to hold a “meaningful” dialogue with India, noting that the neighbouring country’s “irresponsible behaviour and recurring incidents of persistent violations along the Line of Control and Working Boundary has put regional peace at stake”. He said the purpose of our conventional and atomic prowess was to ensure regional and international peace. President on the occasion once again extended Pakistan’s moral, diplomatic and political support to the people of Occupied Kashmir. “We urge the international community to fulfil its obligations so that the dream of durable peace and regional security is realized,” the president added. He said Pakistan was fighting terrorism for the last many years and country’s armed forces and law enforcement agencies had been acting with courage in this war. “It is because of the sacrifices of our martyrs that Pakistan today is safer than before. Let me make it clear that after operation Zarb-e-Azb, actions against the remaining terrorists under operation Radd-ul-Fasaad will continue till their elimination,” he said. President said Pakistan’s economy was stable and the country was emerging as a strong economic power in the region. “Pakistan enjoys full support of its friends and brotherly countries in this journey towards progress in which the sincere role of China is of great significance,” the president said. President specially thanked the People’s Liberation Army of China for its “first-ever” participation in a military parade outside China. He also appreciated and thanked the contingents of Saudi Arabia, Turkish military band and top representatives of South African Army for participating in the Pakistan Day celebrations. Another feature of the event was the running commentary performed by Col Shafiq, listing separately the salient features as the event unfolded. Meanwhile, Army Chief Gen Qamar Javed Bajwa, paying tributes to the martyrs and injured personnel of the armed forces, termed them “true heroes of the nation who sacrificed their today for the safety of the nation and the country”. He was talking to the injured officers and jawans of the army who lost their organs while in action against terrorists but kept the national flag high. Air Chief Sohail Aman also met the injured personnel and lauded their sacrifices for eliminating terrorists. The Army chief inquired after their health and prayed for their early recovery. He assured them that they will be cared by Pak Army and all possible assistance will be extended to them and their families for healthy life. Also, Indian President Pranab Mukherjee, in his congratulatory message, said that his country was willing to enhance its existing relationship with Pakistan. “Greetings to the government and people of Pakistan on their National Day,” Mukherjee tweeted on the micro-blogging website Twitter. Next articleTom Cruise is no longer single – you won’t believe who his lady love is!